And yet another Resident Evil movie. I've always love watching the Resident Evil movies. Who knew that a video game like that can turn into a successful movie franchise. Truth be told, I've never played that game in my life but I know what's it about. 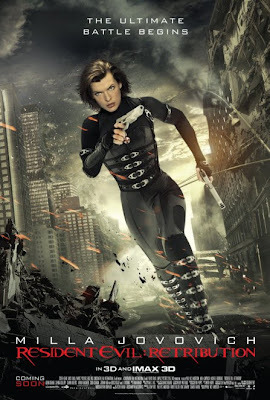 The latest Resident Evil movie with the title Retribution kicks off with where it left off from the last movie, where Jill Valentine was leading a group of the Umbrella Corporation army to take down the survivors at a disguised abandoned ship which is actually an experimental ground for the Umbrella Corporation. It also started with the famous "My name is Alice..." introduction which I so grew to loved. Alice narrated what had happened so far with bits and pieces of clips from past movies. In this movie, Alice was captured after the attack from Jill Valentine's army and was tortured with noise to find out why Alice had turned against the Umbrella Corporation. But suddenly, the power was shutdown and Alice was freed. She made her way through the unknown territory where there were simulations of city zombie outbreaks which she easily surpassed through. She came to the control center of the facility but somebody had beat her to killing off all the guards. The screen then revealed that it was Wesker who had sent Ada Wong to extract Alice out of the facility. Alice soon find out that Wesker is in need of Alice to help him to fight and that Wesker had also sent an extraction team from the ground above the facility in order to break her out. And so, Alice cooperated and teamed up with Ada to get out of there. The facility was controlled by the Red Queen computer intelligence and she's going all out to stop Alice from escaping. As I've mentioned earlier, I loved all the previous Resident Evil movies and so I was very eager to watch this. But to my dismay, this latest one disappoints me. Fighting simulated zombies and all types of mutant type doesn't really roll well with me as the original zombies by the horde where Alice had to fight her way through. Also, this movie is becoming more and more fantasy like Middle Earth style especially the last scene. I sure hope they don't deviate much from the zombie storyline because it's becoming to look more and more ridiculous to me. But of course, there were times that it's enjoyable to watch but somehow it's just not as good as before anymore for me. I still rate it 3 stars out of 5 though. I think I watched the 1st installment.. and never bothered after that..
1st one is the best for me. I think Milla Jovovich is way cool! She's the only reason I watched all the 5 Resident Evil movies! LOL! It's my favorite film,nice share Kelvil,keep in touch.